The Christian life is just that–it is a life. It is for a lifetime. Once we ask the Lord to forgive our sin and by faith trust Christ as our Saviour, we are recipients of eternal life. But what will we do with the short time we are given on this earth? One can live a long life, yet make wrong decisions and waste his life. On the other hand, one could live a short life as far as days and years are concerned, yet make right decisions, and his life will be a great victory for the Lord. Life is about the decisions we make. We need wisdom for these. Imagine that you are a possessor of great knowledge, even education all the way to a terminal degree; that is not the answer. It is not what we know; neither is it who we know. It is what we do with what we know. Wisdom provides the ability to use knowledge properly. In James 3:13-18, God’s Word tells us that there are two kinds of wisdom. One wisdom is earthly, sensual, and devilish, but there is another wisdom that is from above. The greatest thing we could possess is this wisdom from above because it will enable us to make right decisions and right choices which are better than great riches. In Job 28:12-13 we read, “But where shall wisdom be found? and where is the place of understanding? Man knoweth not the price thereof; neither is it found in the land of the living.” Search the world over and you will only find the earthly, the sensual, and the devilish. The answer to Job’s question is found in verse twenty-eight, “Behold, the fear of the Lord, that is wisdom; and to depart from evil is understanding.” The only place you can find wisdom that is from above is in the One who came down from above to this earth and gave Himself a ransom for our souls (Colossians 2:2-3). He lives in you if you have been born again! No one can make this choice for you. You can expose your children to these truths, but the day must come in their lives when they make the choice for wisdom for themselves. No one can force anyone to be a Christian, and no one can force anyone to live the Christian life. I want this wisdom that is from above. It is the most important thing I can have as a Christian, as a husband, as a father, and as a friend. 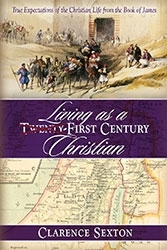 You may order a copy of this book by clicking on the title above or calling Crown Christian Publications toll free 1-877-AT CROWN (1-877-282-7696).